I Heart My Neighborhood Toy Store and I personally love finding quality unique toys that my children enjoy playing with that also stimulates their mind and imagination. 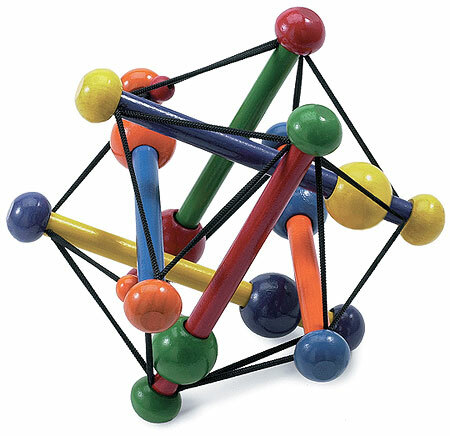 Big box stores do not always carry these high quality toys and I feel they often cater to "fad" toys that children outgrow quickly and are usually cheaply made. At your local toy store you can find a wide selection of the best toys on the market that your children will really enjoy playing with. In addition, shopping locally offers better customer service and is a great way to support your community! November 9, 2013 is the 4th annual Neighborhood Toy Store Day. Participating local stores will host in-store events for families (such as activities, craft projects, live performances and/or special discounts) to help kick off the holiday shopping season and celebrate the joy of shopping for toys! This annual event is coordinated by the non-profit organization ASTRA, the American Specialty Toy Retailing Association. You can find a participating toy store at Your Neighborhood Toy Store. Clara absolutly loves her Skwish Classic by Manhattan Toy. This is an innovative wooden rattle that truly provides her with entertainment. I have seen her push it, squish it, drop it toss it, shake it and reach for it when it gets away from her. It definitely holds her attention and encourages grasping and reaching skills which is very important for a 6 month old!! 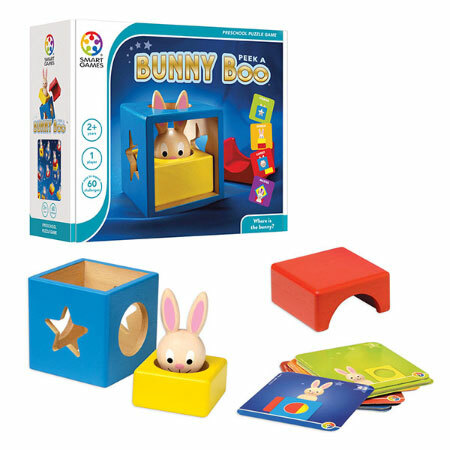 Bunny Peek A Boo by Smart Toys and Games, Inc. is a 3D puzzle made up of sturdy wooden blocks and a cute rabbit character. Juliette and Emily loved solving these puzzles by choosing one of the cards and recreating the picture they see with the wooden pieces. This game helps develop spatial perception skills. RingStix Lite byRingStix System Enterprises LLC is variation of the game of catch. Players pass the ring back and forth using two sticks that are available in a variety of colors. this game can even be played independently. The girls are really looking forward to testing this out once the weather is warmer.